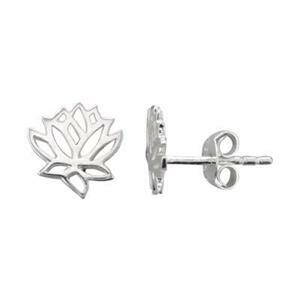 Sterling Silver 8.2x8.8mm Lotus Stud Earrings, 1mm Post Thickness, Clutches Included. Order 2pcs to get one pair of earrings. Color Me … The color of the lotus flower determines its own special meaning. The Blue Lotus Flower represents wisdom and intelligence. The White Lotus Flower symbolizes mental purity and peacefulness. The Red Lotus Flower is related to the heart, and is associated with love and compassion. At Halstead - The SNE39 Lotus Flower Stud Earring Postss - are a Bright Sterling Silver – so they can represent any color your heart wishes.